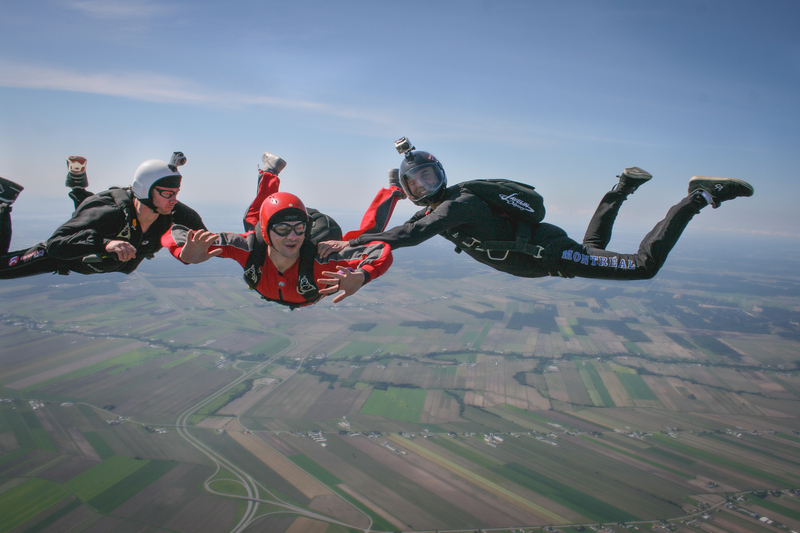 Skydiving is one of the most exciting and challenging sports in the world today. If you live in Canada and are interested in learning to skydive, this section will point you in the right direction. See our Member Directory for a location near you! Most have a website for further and updated information. This involves a minimal amount of training, of approximately 15-30 minutes with a manufacturer's (non-CSPA) certified tandem instructor. Once you are geared up, your instructor and you will exit the aircraft attached together, for a freefall and parachute ride. You should check with your chosen school to see if tandem jumps are available. In this method, from a minimum altitude of 7,500' (commonly higher than 10,500') you will exit the aircraft with two CSPA certified instructors holding you. They will assist and evaluate your freefall performance. You are given the opportunity to activate your main parachute. If you choose not "to pull it yourself", they are there to assist you with parachute deployment. A solo canopy descent follows the freefall and you will be guided to landing via a CSPA certified instructor. Training prior to your first jump will take most of the day, approximately 6-8 hours. You should check with your chosen school to see if First Jump PFF training is available. You get to jump solo from a minimum altitude of 3,000'. A CSPA certified instructor will assist the deployment of your main parachute. Your freefall will be from two to five seconds. You will perform basic parachute manoeuvring while being guided in for landing by another CSPA certified instructor. Training prior to your first jump will take appoximately 4-5 hours. You should check with your chosen school to see if IAD training is available. In this method, you will exit from an aircraft under direct supervision of a CSPA certified instructor, from a minimum altitude of 3,000' attached to a line. When this line stretches, it deploys your main parachute for you. Similar in fashion to "military jumping". You will have the opportunity to perform basic parachute manoeuvring while being guided in for landing, by another CSPA certified instructor. Training prior to your first jump will take approximately 4-5 hours. You should check with your chosen school to see if SL training is available. The cost of your first jump is set by the school you will take your training from.